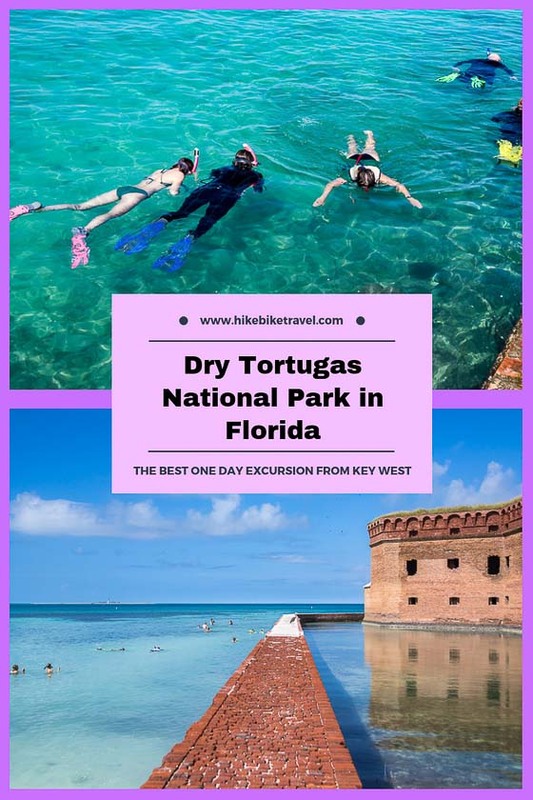 I first heard about Dry Tortugas National Park on a trip to Key West in 2015. Since then I’ve been pining to visit, especially after drooling over beach photos on Instagram and Pinterest. Dry Tortugas National Park is small, covering only 100 square miles and much of that is ocean. It sits at the westernmost end of the Florida Keys approximately 67 miles west of Key West and 37 miles west of the Marquesas, the closest islands. Dry Tortugas is named for the abundance of sea turtles when it was discovered in 1513 (tortugas) and the fact that there is no source of fresh water (dry). It can only be accessed by boat or by seaplane. 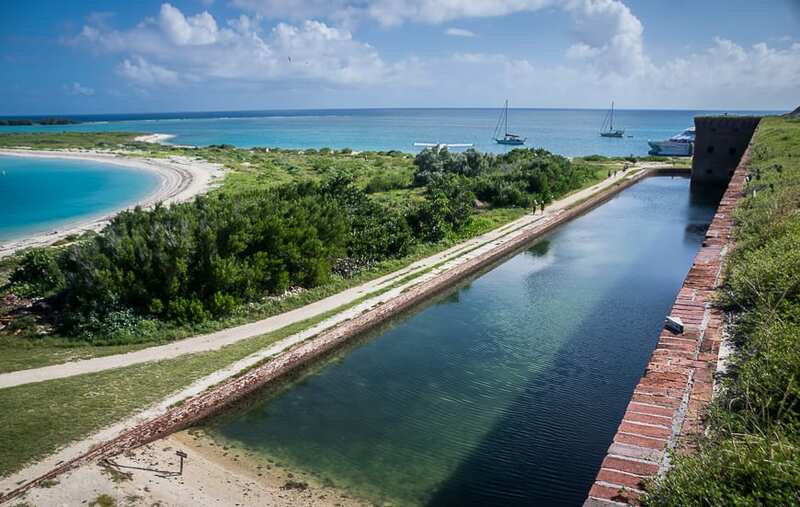 Why do more than 80,000 people a year make the trip to the Dry Tortugas? How do you make the most of your time on a day trip to Dry Tortugas National Park? It’s a combination of things. Gorgeous beaches, fantastic birding, coral reefs, interesting history around the civil war era Fort Jefferson, natural beauty, snorkeling and even camping. That’s exactly the question I posed to Hollywood, one of the guides on the boat – the Yankee Freedom III. He gave me an hour by hour itinerary which I followed almost to the tee. First off he told me to put my bathing suit on before we landed at 10:30 AM so I could pick up snorkeling gear on the dock as soon as it was available. Then I’d have a full hour to snorkel before I picked up a lunch. If you haven’t brought your own gear be sure to sign the waivers on-board for the snorkeling gear, all part of the price of taking the catamaran. (Waivers can be signed after breakfast.) Hollywood also suggested I check out both the North Swim Beach and the South Swim Beach to see where the water was calmer. I ended up snorkeling at both beaches but enjoyed the South Swim Beach more as you can swim alongside the moat for about a quarter of a mile. I also found more underwater life and better visibility as it was a tad calmer on this side, though that can change by the hour. Look for colourful fish close to the walls of the moat. That seemed to be where they liked to hang out. There is the option to snorkel out to the Coral Heads but I gave that a pass. I also enjoyed watching the heron eat at the minnow bar in the moat. The moat surrounds Fort Jefferson and although there isn’t much of an exchange of sea water, enough fish get in and out that the heron has clued in to the easy pickings. When the fort was built, the plan was to use the moat as dumping ground for all waste. Unfortunately someone didn’t do their homework. The difference between low and high tide isn’t large so the moat doesn’t get a twice daily flush the way the fort designers back in the mid-1800’s figured it would. Needless to say, the smell of raw sewage in the heat with up to 1,800 people packed into the fort would have been revolting. There is no sign of that nastiness today but note that you’re not allowed to swim in the moat. There’s a wall beside the moat that you can walk along for 0.6 miles. This is the South Swim beach area. With turquoise-coloured water a perfect temperature for swimming, you could nix the snorkeling if you’re not comfortable with that and simply enjoy some beach time and a cooling dip. The only thing you’ll have to do is return to the boat to make your lunch somewhere between 11 AM and 1 PM. You can carry it back to the beach with you but be sure to pack your garbage out to the boat. I enjoyed my lunch on a gorgeous sand beach overlooking Caribbean blue water on the north side of Bush Key. Afterwards I wandered towards the end of the key but ran out of time to do the full loop on the beach – because to keep to the schedule Hollywood suggested, I needed to run to catch the 90 minute history tour of Fort Jefferson that started at 12:40 PM. On the beach I was second guessing myself about the history tour and considered skipping it but I’m so glad I didn’t! Shortly after you get off the boat there is the option to listen to a 20 minute history talk about Fort Jefferson. Hollywood told me to give that talk a pass and opt for his 90 minute tour instead. I like history but I also love beautiful sand beaches – and I don’t get enough beach time in my life. But still I highly recommend the tour. Ninety minutes of history literally flew by – though that may be due in part to Hollywood, who lived up to his name and delivered a compelling narrative about the fort. The first thing I learned was that the third largest reef system in world ends at Garden Key and the other islands that make up Dry Tortugas National Park – so no boat could get into the Gulf of Mexico until they got past these islands. And it offered the only safe harbour at the time in the Gulf of Mexico. It still acts as a haven for boats during storms! 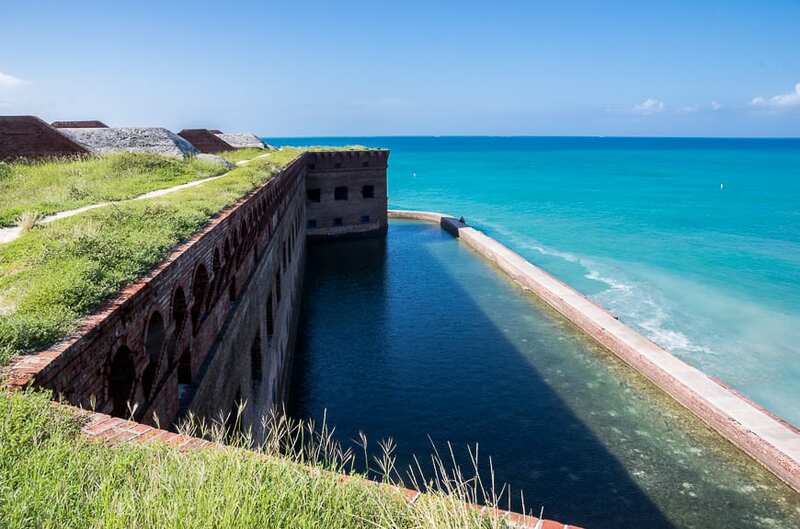 Fort Jefferson was built between 1846 and 1875, with the goal that it be big and powerful enough to defend for an entire year. To that end it was built with 16 million bricks that had to be brought by ship (an 18 hour trip in those days) and offloaded by hand. The fort remains as the largest masonry structure in the Americas today. The bricks were but one of the countless items that had to be brought by boat as the only things the islands could offer were coral, sand and sea water. Hollywood led us from the first floor up to the rooftop over those 90 minutes, stopping in shade (thankfully) to tell stories of how the fort was built and what life was like for the poor Union soldier stationed here. As I visited in November I can only appreciate just how miserable those poor buggers were in summer – what with a wool uniform, awful food and water rations – nothing like the experience of today’s visitor. History buffs will be in their element on this tour! After the tour I had all of about 25 minutes before the boat left at 3 PM – not quite enough to complete the beach loop I’d wanted to do after lunch. I think I need a return trip – next time overnight so I can enjoy the experience at a more leisurely pace along with the sunsets the park is so famous for. A big thank you to Hollywood for laying out a timeline to fit in as much as I did. For information on camping in Dry Tortugas National Park click here. You can book tickets online to visit Dry Tortugas National Park. You might also enjoy reading about my Miami to Key West Road Trip. Thank you to the Florida Keys and Key West Tourism for hosting my visit. This is one park I HIGHLY RECOMMEND visiting.